* The fence in parts of left field is 7 feet tall; see the final paragraph below for details on the changes in 2016. BEEN THERE: I paid brief visits to Marlins Park on March 5 and 6, 2017. Joe Robbie Stadium (as the home of the Florida Marlins was originally called) was never intended to serve as a baseball stadium over the long term. But even so, the Marlins failed to generate local political support for a new stadium, in spite of having won two World Series (1997 and 2003). Meanwhile, the Miami Dolphins football organization was warning the Florida Marlins that they would not offer a lease renewal, which could have left the baseball team "homeless." From late 2005 through early 2007 representatives of the Marlins visited Portland and other cities in search of a new home, without success. In February 2008, after years of hard bargaining, the governments of Miami and Miami-Dade County agreed in principle to help fund a new baseball stadium for the Florida Marlins, but that wasn't the end of the long saga. During the summer of 2008, the Orange Bowl was demolished, but hopes that a new stadium would soon be built in that plot of land near downtown Miami were repeatedly put on hold. (The annual Orange Bowl game has been played in Dolphin Stadium ever since 1996.) 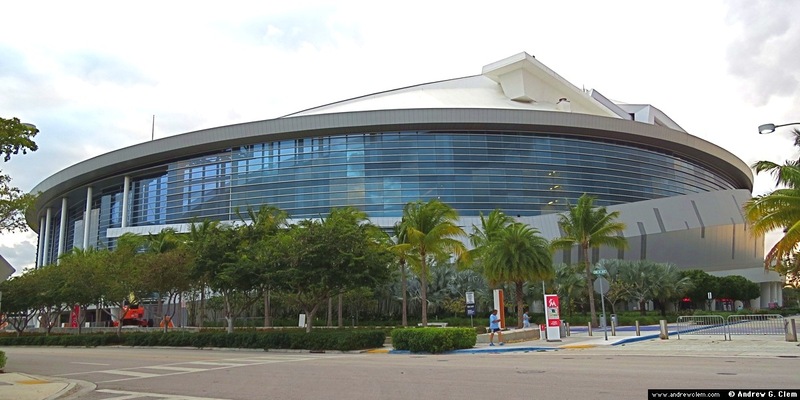 Finally, in March 2009, funding for a new Marlins baseball stadium was formally approved by the Miami-Dade County commissioners, and construction of a retractable-roof facility began in July. It was mostly finished during the summer of 2011, and was completed in time for the 2012 season. Obviously, the design of this stadium bears a lot in common with Minute Maid Park and Safeco Field, as far as how the retractable roof influences the overall shape. The roof has three movable sections, sliding along a set of rails that is supported by eight enormous concrete pillars and four additional flared pylons on the west side of the stadium. The elevated supporting rail is higher on the north side, where the third base side of the granstand is, than on the south side. 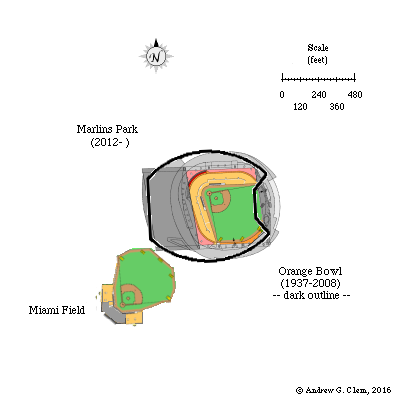 The size of the outfield is surprisingly big for a domed stadium. Both bullpens are beneath the outfield seating sections. The fence in center field is about 13 feet high and gradually recedes in height toward right center. The field has certain parallels with Turner Field, as far as the broad curve in left field and the straight, outward-angled wall in right field. There are all sorts of structural oddities, such as the slightly tapered profile of the upper decks near the respective foul poles, where there are four fewer seating rows. On the left side, that was necessary to make room for one of the giant supporting pillars. The signature feature inside the park is a gloriously tacky, psychedelic multi-colored display situated behind a curved nook just to the left of center field. Designed by Red Grooms, it cost $2 million to build and features pink flamingos, a sun, seagulls, and two large mechanical marlins that jump up whenever a Marlins player hits a home run. The concourses are filled with other works of art, reflecting the interest of the Marlins' owner, art dealer Jeffrey Loria. Another aesthetic touch is the lime green trimmings on the fences in front of the seating areas. To accentuate the team's marine-wildlife identity, there is even a fish tank near the dugouts. There are a variety of eating establishments that highlight Miami's Latin (especially Cuban) ethnic heritage. Well-heeled patrons can reserve "The Clevelander" (a.k.a. "La Playa"? ), a private party area at field level next to the bullpen in left field. It features an exclusive bar, table service, and swimming pool. Coupled with the beautiful exterior landscaping and the dazzling view of the downtown Miami skyline through the giant window beyond left field, it all makes for a tremendously exciting experience. Quite a contrast to the Marlins' bland former home in the northern suburbs! After a few exhibition games, the official inaugural game at Marlins Park was held on April 4, 2012, as the visiting (world champion) St. Louis Cardinals defeated the Marlins, 4-1. After a slow start in their first month as the Miami Marlins, the team set a franchise record by winning 21 games and losing only eight in May. The Marlins had great expectations under the new management of Ozzie Guillen, formerly of the White Sox, and with newly-acquired stars as Jose Reyes. But Ozzie offended local fans in South Florida by saying nice things about Fidel Castro, while the team failed to perform well. After the inaugural 2012 season, team owner Jeffrey Loria traded away Jose Reyes and other key players, and the team's prospects seemed bleak. But the sudden emergence of slugging star Giancarlo Stanton and other fresh talent raised hopes once again that the Marlins might soon become a contending team. Marlins Park hosted World Baseball Classic games in March of both 2013 and 2017. On November 14, 2012, an international soccer match was held at Marlins Park for the first time, as 13,372 fans watched Nigeria defeat Venezuela, 3-1. Prior to the 2016 season, a new fence was built in center field, reducing the distance in that direction from 418 feet to 407 feet. The gap between the old wall and the new fence gradually shrinks as it approaches the 392 mark in right-center field, and is filed with shrubbery. As a result, fair territory shrunk from about 116,300 to 114,600 square feet. In addition, portions of the fences in left field and right field were shortened: from 11.5 feet to 7 feet tall between the digital display in the left field corner and the out-of-town scoreboard, and from about 15 feet to 8.5 feet tall in center field; originally, the height of the wall tapered down from 15 feet to 11.5 feet between the Home Run Sculpture and the Marlins bullpen in right field. These changes helped to make Marlins Park slightly less pitcher friendly. Click on the camera icon ( ) links below to see the photos, one by one.